When you travel to or from Los Angeles, it is a good idea to make everything as easy on yourself as possible. From the quickest way to book your flight to the most efficient way to get from the airport to your hotel, it is all about making life simple. The simpler the process, the less that can go wrong. That is why you should consider booking Los Angeles airport parking in advance, and make one more step in the process easy and worry free. As you might imagine, Los Angeles International Airport (LAX) has more than 25 different airport parking lots at which you can reserve a space before you fly. They are located primarily near the intersection of the I-105 and I-405, with more along West Century Blvd. The options vary from lot to lot. Los Angeles International Airport, more commonly known by its airport code of LAX, is about 15 miles from downtown Los Angeles. It is one of the world’s busiest airports, and serves as a major departure point for flights to the South Pacific and Asia. Only United Airlines operates a hub at LAX, but American Airlines, Delta Airlines and Alaska Airlines all consider Los Angeles a “focus city” and have frequent flights to and from LAX. For traffic information to help you get around LA’s notoriously bad traffic jams, see the city’s traffic website. Planning a long drive to or from the airport, or an odd-hours flight? 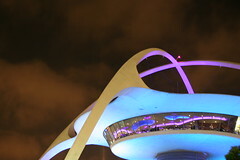 Check out Los Angeles Airport (LAX) park and sleep hotels. Don’t fancy driving to the airport? Or leaving your car there and paying for parking? Catch a shuttle to LAX.